In what way is Underwater Cultural Heritage taken into account in MSP? How can a classification of Underwater Cultural Heritage be useful for the development of underwater tourism? ii) for which excavations and uncovering, and other methods of investigating the history of humanity and its environment are the basic source of information are considered to be objects of UCH. The underwater cultural heritage comprise also submerged settlements, and landscapes (fig. 2-3). A cultural landscape is the result of historic transformation of natural environment by people inhabiting a given area throughout the centuries. The maritime cultural landscape occurs if such ancient/old settlement areas are permanently covered by sea water due to the changes of the coast line and marine bottom. In accordance with international law (Articles 149 and 303 of the UNCLOS convention) objects of archeological or historic character, shall be protected in order to preserve and use them for the good of humanity. Thus usually UCH is protected in the internal and territorial waters as well as in contiguous zone and access to the UCH objects is regulated. But in the exclusive economic zone (EEZ) the UNCLOS provisions might be overridden by the Law of Salvage and law of Finds. It means that jurisdiction of the coastal states over their EEZ assets do not necessarily affect the ownership of underwater cultural heritage. Therefore those who find ancient shipwrecks and property (outside national jurisdiction zone) are entitled to penetrate them and come into their disposal. The MSP cannot change this situation, however it can propose some precautionary provisions in the fields being under jurisdiction of the coastal states i.e. preparation of investments, issuing mining concessions, lying cables etc. However it seems that in a long run adoption of the UNESCO Convention on the Protection of the Underwater Cultural Heritage is the best solution. UCH requires protection and conservation but partially it can be opened for the tourists that can dive and visit the selected objects of UCH in the way which is not harmful for those objects and safe for tourists. For instance Polish sea areas are rich in underwater cultural heritage objects. The specific conditions of the Baltic Sea (low salinity, low diversity of species, relatively low temperature, low oxygen content, etc.) limit or even prevent the development of many marine organisms and bacteria, fungi and clams (e.g. shipworms) causing damage and decomposition of wood, which results in a very good condition of preserved underwater heritage objects. Thus possibility to visit UCH can build the tourist attractiveness of the coastal areas, create new jobs and provide coastal communities with an additional income in line with the Blue Growth concept. It offers also to fishermen an alternative source of occupation which might be important due to shrinkage of their economic base (available fish stock). 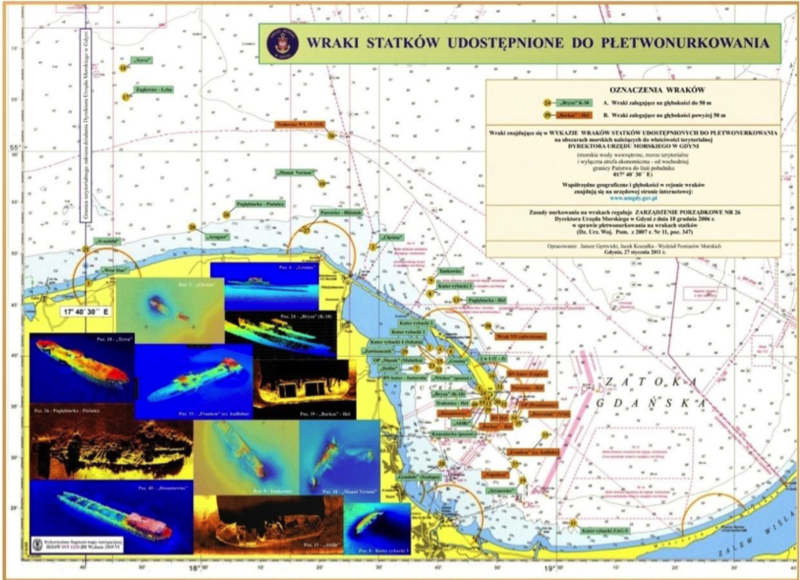 Issues concerning wreck exploration are regulated by the Act on sea areas of the Republic of Poland and maritime administration. Wreck diving requires obtaining a permission. Maritime Offices in Gdynia and in Słupsk approach the issue in different ways. The Maritime Office in Gdynia has developed and published a list of wrecks accessible for scuba divers. There are 40 objects on the list (including 29 at depths smaller than 50 m) (Fig. 5). The Maritime Office in Słupsk has issued a regulation indicating objects from the Registry of Underwater Archaeological Sites on which diving is forbidden. Penetration of other wrecks is allowed. Both Maritime Offices keep records of departures for wreck exploration, The areas of jurisdiction of the aforesaid Maritime offices are shown at figure 6. It is difficult to assess the effectiveness of both methods in terms of boosting blue growth. Definitely the wrecks under supervision of Maritime Office in Gdynia are more frequently visited (fig. 7-8). However this can be due to many other factors than only a permission system. Wrecks under jurisdiction of the Gdynia Office, can be more attractive and the ports close to them can be better equipped with the scuba-diving services. However, in general the prevailing opinion is that simple licensing access to wrecks and recording of departures for wreck exploration, is not sufficient for UCH preservation. “The present easy and uncontrolled access to wrecks may lead in a very short time to irreversible damages and significant deterioration of their value as a tourist attraction. Wreck tourism, as it functions now, does not make full use of the potential of Baltic Sea wrecks, and often does not fulfil basic requirements of safety and comfort of the activity. It also does not protect the wrecks against robbery diving” (Matczak et al. 2015). Thus as a part of the MSP debate in Poland an idea was created of opening access to some wrecks or groups of wrecks under direct supervision of maritime archaeological services (so called "archaeological park”). Gathering in one place all wrecks that must be removed for safety reasons or in order to protect them against damage can help in controlling the UCH tourism since such a place can be easily screened and monitored. This practice is applicable in any country in which UCH can be exploited.